Turkey’s deputy prime minister apologized for police violence against demonstrators, but failed to quell the ongoing anti-government protests, as clashes with police continued for a fifth night. Police again used tear gas and water cannon to control protests on Tuesday night, according to Reuters. A series of nationwide anti-government protests were sparked when police used tear-gas and water cannon to break up a 4 day sit-in demonstration against the destruction of trees in Taksim Square in Istanbul on Friday. The prime minister has taken a hard-line approach to the protest, on Monday labelling the demonstrators as ‘looters’ with links to ‘terrorism’ as he left the country on a state visit. The deputy prime minister stepped in on Tuesday, in contrast apologizing for the police violence. “The excessive violence that was used in the first instance against those who were behaving with respect for the environment is wrong and unfair,” deputy prime minister Bulent Arinc said during a press conference yesterday afternoon. “Our citizens showed their legitimate, logical and righteous reaction at Gezi Park… I apologise to those citizens,” reported the BBC. Mr Arinc also confirmed that a second person had died during the protests, and said 244 police officers and 64 protesters had been injured across the country. 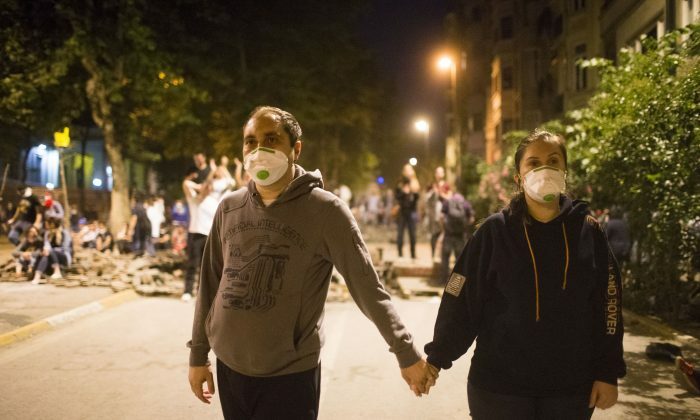 The Turkish Medical Association, however, said that over the course of the weekend at least 3,195 people had been injured in the protests, 26 in a serious or critical condition, according to the Independent newspaper.